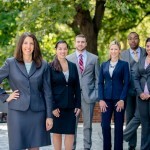 Firm President, Sheryl L. Axelrod, standing before a number of the attorneys she mentors — from left to right: Melissa Pang, Dan Oberdick, Vanessa Snyder, Damian Sammons, and Neelima Vanguri. Women and minority attorneys face a great deal of discrimination in the legal profession, particularly as they become more seasoned. They are being held back and denied proper pay, and as they are becoming more experienced, they are leaving law firms in droves. The numbers tell the story. There are many outstanding women and minority attorneys. However, as I discussed in my article,“The Dollars And Sense Of Diversity,” while nearly 33% of practicing lawyers are women, in 2012 when I published my piece, women accounted for only 15% of equity partners at large law firms. They still account for only 20% of them. Even female equity partners are subjected to discrimination. They are paid 86% of what their male peers are rather than dollar for dollar as they deserve. The numbers are worse for women of color. They made up a mere 2.04% of law firm partners in 2011. When you add male attorneys of color to the equation, the numbers improve, but are still not representative of minorities’ numbers in law firms. Minorities account for only 6.56% of partners in the nation’s major law firms whereas 12.7% of the lawyers in them are minorities. These numbers must change, and I am committed to making them change. In “The Dollars And Sense Of Diversity,” I wrote about the profitability of having women and minorities in positions of power in representative numbers. The article was the cover story of the July / August 2012 issue of The Pennsylvania Lawyer, the magazine for the Pennsylvania Bar Association and its 28,000 members. I likewise wrote about the competitive financial advantage diversity represents in “Disregard Diversity at Your Financial Peril: Diversity as a Competitive Financial Advantage,” which was published in the May / June 2013 issue of Diversity & the Bar, the national magazine published by the Minority Corporate Counsel Association. “Diversity as a Competitive Financial Advantage,” was made a featured article by the American Bar Association (the largest bar association in the world). It was also published by the National Association of Women Lawyers (NAWL), and emailed by NAWL to all of its members. The fact that diversity is profitable is now seeping into the national consciousness. Since the publication of these articles, Nicholas Kristof authored a New York Times Opinion piece in close alignment with it. See: “Twitter, Women, and Power.” Also since their publication, I have been invited to speak to the partners and shareholders of a number of law firms, and to the attendees at the Pennsylvania Bar Association’s Diversity Summit. Facebook Chief Operating Officer Sheryl Sandberg was a keynote speaker in a free, live “Take the Lead Challenge” webcast in favor of equal pay in which approximately a million viewers participated worldwide. I was asked to write materials for the Challenge. I wrote my latest piece, “A Primer on Diversity, Inclusion, and Equality: From the Profitability of Diversity to Unconscious Bias to its Impact on Our Country,” in response to that request. The piece is featured on the “Take the Lead” website. that appears in the book Grit, The Secret to Advancement – Stories of Successful Women Lawyers. Also to help women, I spoke to a packed audience of the Philadelphia Bar Association’s Women in the Profession Committee with Court of Common Pleas Judges Marlene Lachman and Frederica Massiah-Jackson about “How To Effectively Deal With The Obstreperous Lawyer.” In this context, the word “obstreperous” means a bullying and/or unethical lawyer. To hear our suggestions, just listen to the podcast of the event. On the American Bar Association (ABA), I was appointed and served as a Diversity Fellow, and was then appointed to, and served on, the ABA’s Task Force on Gender Equity. The year I was appointed to the GETF, only two other people in the country were selected by the President of the ABA to be added to the GETF from the pool of applicants across the country vying for the spots. I also serve as a member of the Diversity and Amicus Committees of the National Association of Women Lawyers. In the Pennsylvania Bar Association Commission on Women in the Profession (PBA WIP), I am a member of the Executive Council and of the PBA Diversity Team and I Co-Chair the PBA WIP Diversity Committee. I also serve on the Philadelphia Bar Association Women’s Initiatives in Law Firms Task Force. In May, 2012, I moderated a panel concerning Section 342 at the NAMWOLF Regional Meeting in New York. NAMWOLF stands for the National Association of Minority and Women Owned Law Firms. My panelists were Counsel in the Office of Minority and Women Inclusion (OMWI) in the United States Securities and Exchange Commission (the SEC), Tracey McNeil, and the Deputy Director of the Federal Deposit Insurance Corporation (the FDIC) OMWI, Leslie Crawford. The panel was so well received, I was given my first appointment within NAMWOLF, Chair of the NAMWOLF Dodd-Frank Ad Hoc Committee. In the volunteer post, I led a national effort on behalf of NAMWOLF to expand the business opportunities available for minority and women-owned law firms as a result of Section 342 of the Dodd-Frank Act, federal legislation designed to increase the participation of women and minority owned businesses with the federal regulatory financial agencies, their prime contractors, and potentially their regulated entities. In October 2012, I moderated the luncheon panel meeting at the NAMWOLF Annual Meeting in Atlanta with high level in-house counsel from GlaxoSmithKline (GSK) and Merck, and a GSK procurement specialist. Normally, 2-4 NAMWOLF panels take place at a time. The luncheon panel meeting is a stand alone session for everyone attending the NAMWOLF Annual Meeting — all the NAMWOLF member law firms and our supporting corporations, non-profits, and governmental entities. There were probably well over 500 people in attendance for our presentation. During it, we discussed how law firms can navigate the procurement process, and the skills, qualities, and fee proposals women and minority-owned firms may be uniquely able to offer that can help them successfully procure work and grow their businesses. In June 2013, I was appointed by the NAMWOLF Board of Directors to the Advocacy Committee. In that role, I am working with NAMWOLF Board of Director members and our CEO, advocating nationwide for the greater inclusion of minority and women-owned law firms. Many lawyers in NAMWOLF firms started out as I did: at the nation’s largest law firms handling the biggest, most complex of cases. From there, armed with impeccable skills, training, and experience, they founded their own law firms and within them, broke down discriminatory barriers they faced in the profession. The Advocacy Committee’s mission is to eradicate barriers that limit minority and women-owned law firms’ access to business, so they can reach their full potential. For these and other efforts, I was honored with NAMWOLF’s 2017 Yolanda Coly Advocacy Award. This award, given out once a year, recognizes an individual of influence with wide ranging professional connections who, through stellar advocacy, profoundly advanced NAMWOLF’s mission of promoting diversity.